In terms of taking care of my skin, I admit that I’m really lazy. Neither is my regime very elaborate nor do I use a ton of expensive products. Just a basic cleanser, moisturiser, scrub, toner (when I remember to use it!) and a face pack once a while. For about a month now, I’ve been following more or less the same regime but with a host of new products from Oilcraft Naturals, a company founded in 2009 to bring premium quality skin and hair care products to everybody who genuinely cared about a non-chemical route to beauty and wellness. The products have impressed me no end and the effect on my skin has been so good that I just had to share my experience with all of you. Oilcraft Naturals is crafted out of long standing Indian traditions of perfume making and marrying it to modern technology to deliver outstanding results. It was a natural culmination of a 110 year old family business out of Kannauj in UP and Kolkata and was established to serve as the wellness arm of a perfumery chain of companies. The company has a range of products in Body Care, Hair Care, Facial Mists, Facial Care, Essential Oils, Soaps and Zodiac Blends. 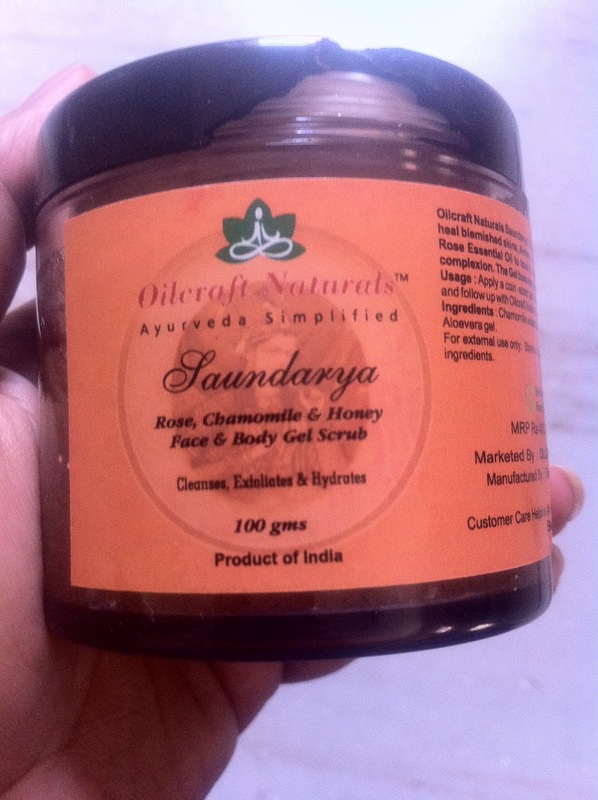 And they are also one of the production units for Kama Ayurveda and Forest Essentials! 1. 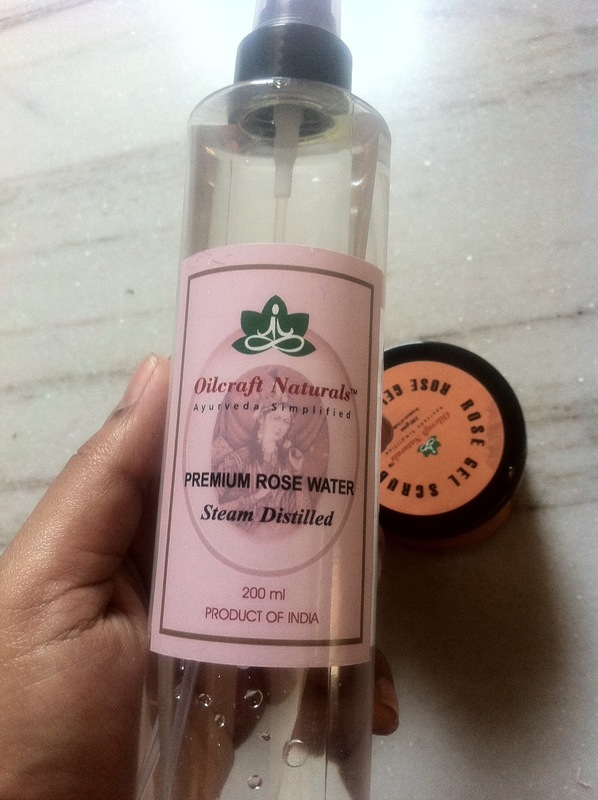 Premium Rose Water – This works as an astringent, toner and cleanser. The packaging is very simple – a transparent plastic bottle with a spray mechanism on top. As a cleanser, its very mild and will not take off all the dirt and grime but as a toner and a light moisturiser, this is excellent. The smell of roses is so refreshing and there is nothing artificial about it. As a cleanser, I spray the rose water on my face, and wipe it off with cotton. As a toner, mist and moisturiser I just spray it onto my face and lightly rub it in till it gets absorbed. What’s wonderful about the mist is that there is no greasy feeling on the skin and the water gets absorbed fully. 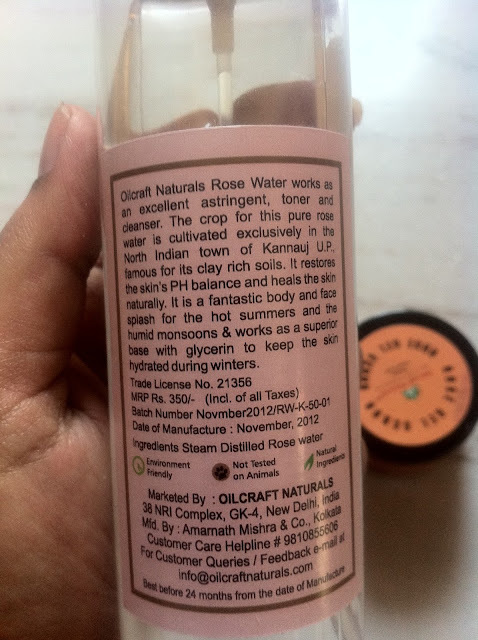 The price is Rs 350 and you get 200 ml of the product which is pretty good. I’ve lost count of how many times, I spray this on my face in a day. Love the delicate fragrance and how refreshing it feels. Perfect for the hot summer months! 2. Saundarya Rose, Chamomille and Honey Face & Body Gel Scrub – This is a mild face and body scrub which is packed with all great ingredients. Again, the packaging is really simple and not that great too look at. It’s a tub, which I’m not too fond of because its unhygienic and really painful while travelling. The product however makes up for the not so good packaging. 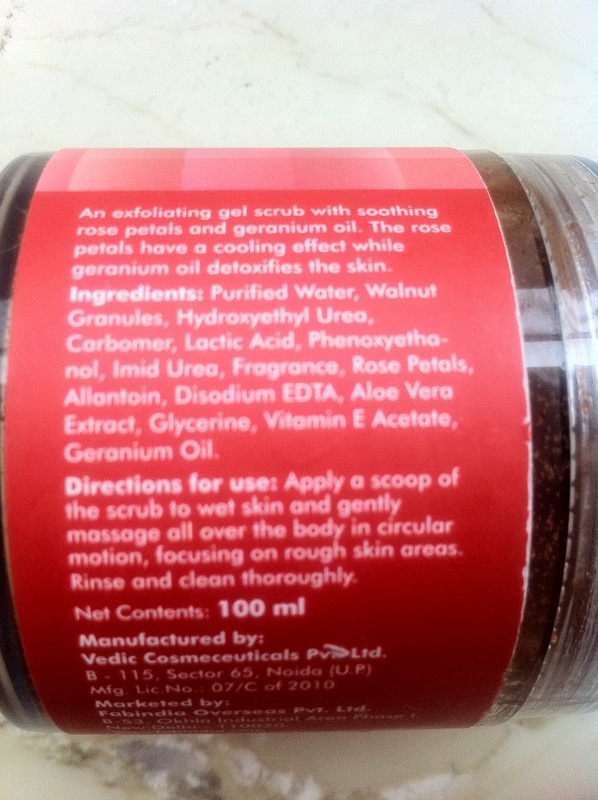 It contains honey, glycerine, almond oil, aloevera, chamomille oil, rose essential oil, apricot and walnut granules. 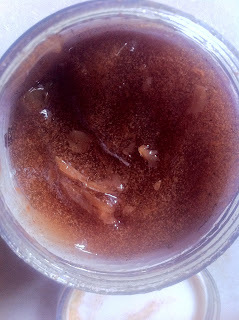 It’s a gel scrub and is mild enough to be used everyday. I however use it twice or thrice a week to get rid of dead cells. Out of all the ingredients, the smell of roses and honey is the strongest. 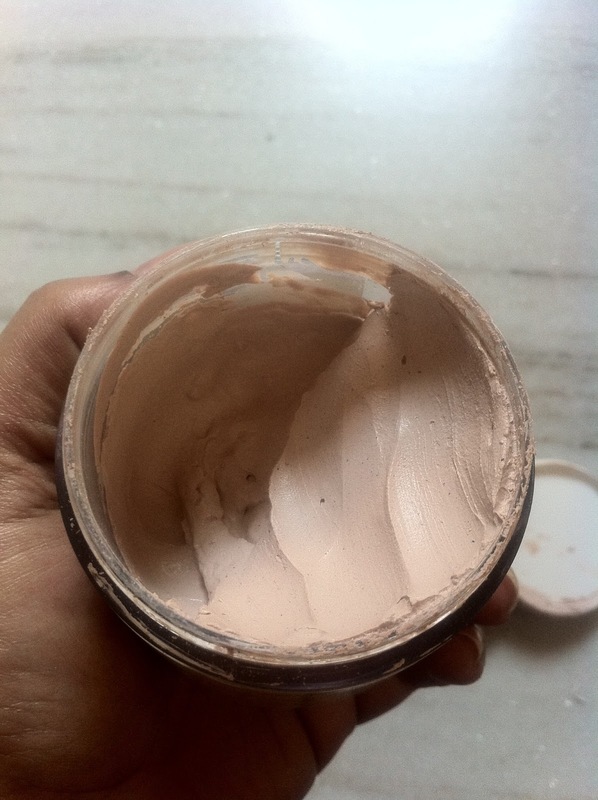 I use it on my face rather than the body coz I feel that for the body, its too mild. The scrub cleanses very well and does not dry out the skin at all. I have normal – dry skin and I have not felt the need to apply a moisturizer immediately. This is good enough to be used on all skin tones. The price is Rs 400 for 100 gms which is slightly on the higher side but then you will only need a small amount and this will last a pretty long time. 3. 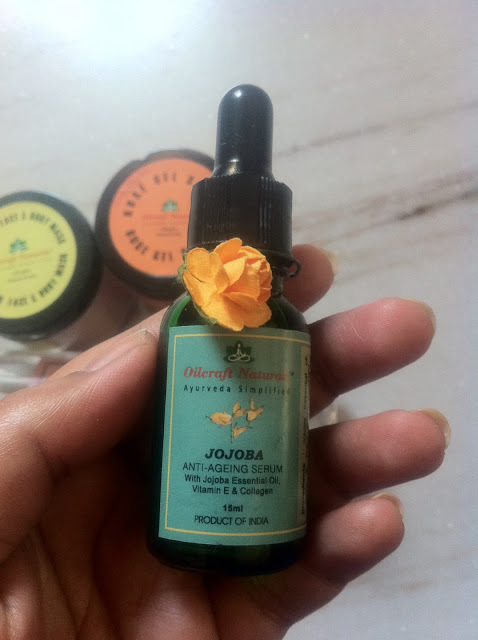 Jojoba Anti-Ageing Serum – Because of my work hours and stress filled lifestyle, the lines and wrinkles have made an appearance much faster than I would have liked them too and also the fact that I’m not getting any younger makes an anti-ageing product a must in my skincare regime. The jojoba serum is again packed with nature’s goodness. It contains jojoba essential oil, vit E, plant collagen, tulsi, ashwagandha, green tea, litchi and fig extracts. I use this at night after cleansing my face and applying the rose water. This is packed in a glass bottle with a glass stopper inside, very similar in looks to the homeopathic medicines in bottles. Again, not safe for travelling at all because this might fall and break. I take 3-4 drops of the serum and massage into my face at night before going to sleep. Even though this is in an oil form, its not greasy and absorbs really fast. The serum claims to combat pigmentation, fine lines, age spots, tanning, dryness and dullness. I definitely have seen an improvement in my skin ever since I started using the serum. Looks brighter, clearer and there’s less pigmentation.For those with super oily skin, the serum might not be a good idea but for those with normal-dry skin looking for an anti-ageing boost, do give this a shot. The price is Rs 500 for 15ml. 4. 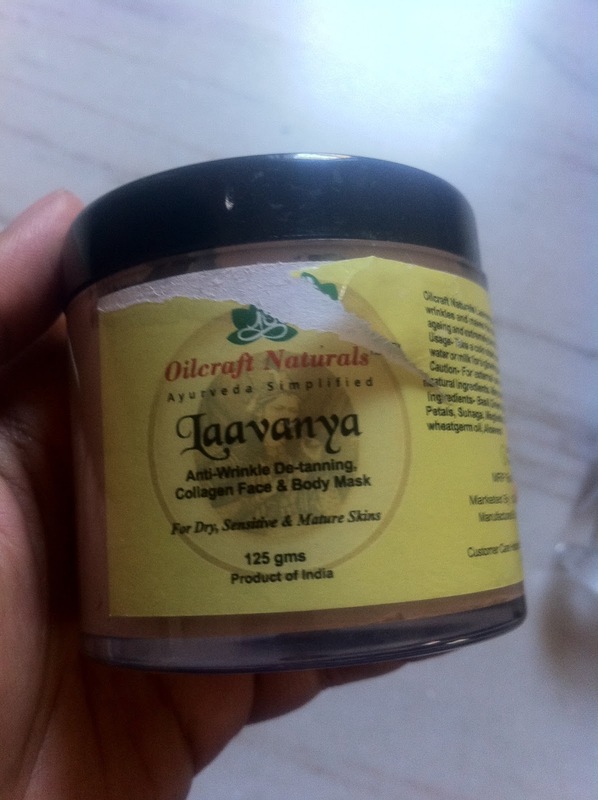 Laavanya Anti-wrinkle De-tanning Collagen Face and Body Mask – This is another anti-ageing product and is perfect for dry, sensitive and mature skin. I use this mask once a week to nourish and tighten the skin. It contains the goodness of basil, green apple, collagen, sandalwood, fullers earth, fenugreek, neem, rose, aloevera and lots of other good stuff. This is a clay mask and I apply it to my face and hands, wait for 20 mins and wash off with water. If you have very dry skin, milk is also a good option to wash it off with. This mask again smells strongly of rose and thankfully dries off very fast. Since it’s clay based, can get a bit dry so I mix in a bit of rose water and then apply to my face. After washing off, my skin is fresh, clean and super smooth. The price is Rs 400 for 125 gms. This is the regime I was following before I went to Delhi and I’ve started on it after coming back as well. Delhi and Agra have given me a very bad suntan and terribly dry skin but the products are starting to show good effect again. Not that my skin is back to being what it was earlier but I can see the tan getting lighter. I’m really pleased with these products and would definitely recommend. If I had to choose two of my absolute favorites, they would be the rose water and the jojoba serum. You have to try these! 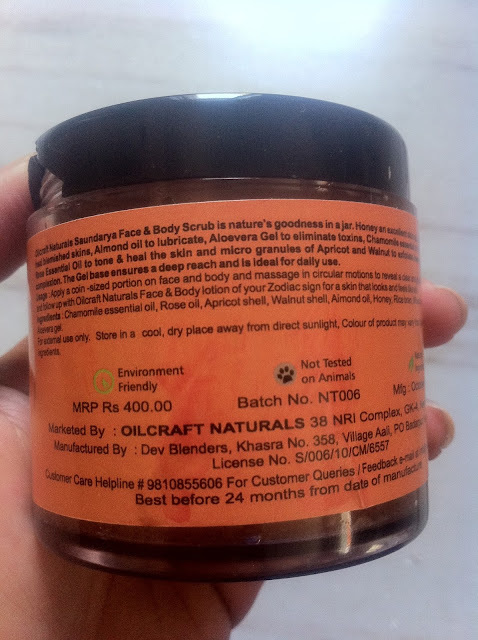 For more information on Oilcraft Naturals and to buy the products,click here. 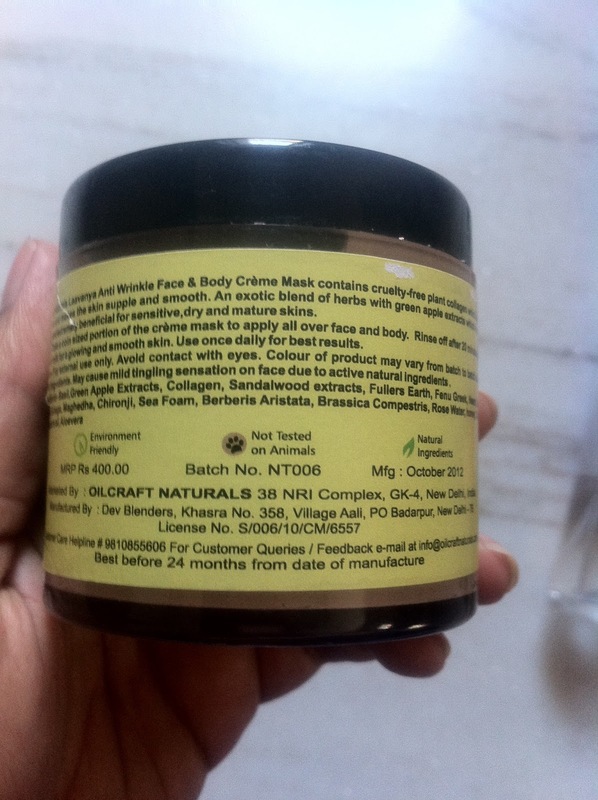 Have you tried Oilcraft Naturals products? What’s your current skincare regime? The Pujas are over, the Mother has gone back to her abode with her children and life in Kolkata is slowly and steadily getting back to normal. The past week, I have enjoyed to the hilt. Stuffed myself with delicious food and sweets paying no heed to calories, was up practically every night till 4.00 am chatting with friends or pandal hopping, got only about 3-4 hrs of sleep everyday, applied more makeup than usual, was out in the sun for a long time…basically I put my skin through a lot of torture!. My skin thankfully was very well behaved during these days but yesterday it just gave up and said Enough! Do not punish me anymore! I can’t take it! The result? About 3-4 huge pimples all over my face! Now I don’t have oily skin so have not faced the problem of acne much. Whenever my skin breaks out, I know it’s probably because I’ve subjected it to some extreme conditions. There are a number of culprits responsible for breakouts and its not just due to oily skin. I came across an article on the net that explained the reasons very well and I thought I would share them with you. I’m no dermatologist, just sharing good to know facts. 1. You are not cleaning your brushes – If you want a clear complexion, make sure to give those brushes a thorough rinse regularly. 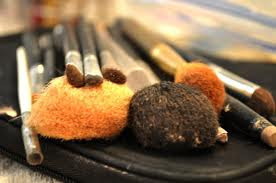 Else, the dirty brushes will transfer bacteria to your face causing breakouts. 3. You Work Out – Sweat itself doesn’t cause breakouts, but it can mix with oils in your pores — and that can lead to acne. When showering after a workout, use a body wash with salicylic acid to keep pores clean. 4. Its That Time of The Month – Hormones called androgens overstimulate the skin’s oil glands, which frequently leads to a breakout around menstruation. Some women find relief by going on oral contraceptives — aka the Pill — but you’ll need to discuss the benefits and risks with your doctor. 5. You are Picking at your Face – Picking at your skin introduces more germs, increases the chances of scarring, and can increase inflammation — which means more breakouts. 6. Its the Weather – Changing climates and seasonal shifts might be the cause of your breakout. If you’ve recently moved or have taken a vacation, see an aesthetician or dermatologist. Usually they’ll be able to help your skin get back to normal. 7. You Need More Sleep – Not sleeping enough inflicts stress on the body, which raises levels of cortisol, the so-called “stress hormone.” In turn, cortisol creates breakouts. Aim for eight hours of sleep per night. 8. You’re Travelling – Along with lousy peanuts and security lines, frequent fliers have one more thing to look forward to: acne. The air in planes is very dry, which can trick your skin into producing even more oil. If you have to be up in the air, pack a noncomedogenic moisturizer in your carry-on. 9. 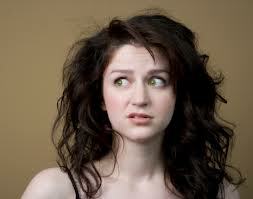 You’re a Bundle of Nerves – Ever notice how your skin seems to break out right before a big event like a job interview? It’s not a coincidence. Simply put, stress is terrible for your body — and that includes your skin. While completely avoiding stress is impossible, you can improve your skin (and overall well-being) by meditating, relaxing, spending time with animals, or doing anything else that calms you. 10. Your Diet is Breaking You Out – Want to change your skin? Change your diet. Eliminating dairy, caffeine, peanuts, seaweed, fried and salty food, sugar, and soy can lead to clearer skin. Good-for-your-skin foods include salmon, dark leafy greens like kale, and antioxidant-rich green tea. Give it a month and see what happens. After all, you are what you eat. 11. 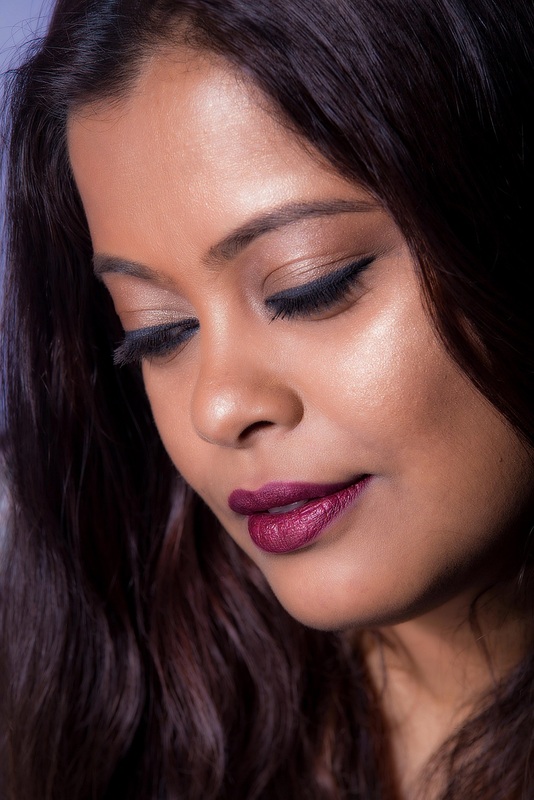 Products are Clogging Your Pores – Comedogenic ingredients build up in pores, and unfortunately, they’re in plenty of beauty products. Looking for products with “noncomedogenic” labels is a good place to start. 12. You’re Washing Too Much or Not Enough – Cleansing your face of sebum, makeup, and dirt is important. Some acne sufferers, however, believe that washing more frequently will lead to better skin. Not so! Cleansing in the morning and evening is all that’s necessary. Any more than that, and you could irritate or dry out your skin. 13. You Go to Bed with Makeup On – Hitting the sack without washing your face is a surefire way to trigger a breakout. If you’re too exhausted to do a full skin care routine, get the worst of it off with a cleansing wipe. 14. You’re not using Effective Treatments – Unfortunately, cleansing your face isn’t enough to make acne flee. To battle pimples, you’ll need ammunition in the form of over-the-counter or prescription treatments. Benzoyl peroxide kills the bacteria that causes acne, so it’s highly effective as a preventative measure. 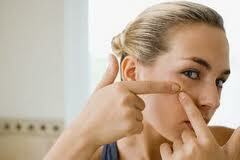 Likewise, salicylic acid can keep pores from clogging. But do check with your doctor before taking these. 15. You’re Pregnant – For some women, a baby on the way means acne in the here and now. Progesterone increases during pregnancy, which can affect the skin’s oil levels. While several safe treatment options exist, others such as Accutane and tetracycline can cause birth defects. To be safe, talk with your obstetrician before embarking on a new skin care routine. Hope you found the post helpful..I sure did ! 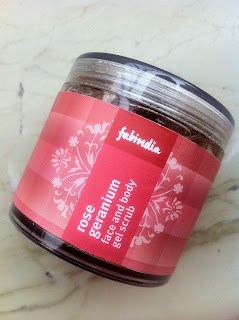 One of my favorite brands for skincare products is Fabindia. 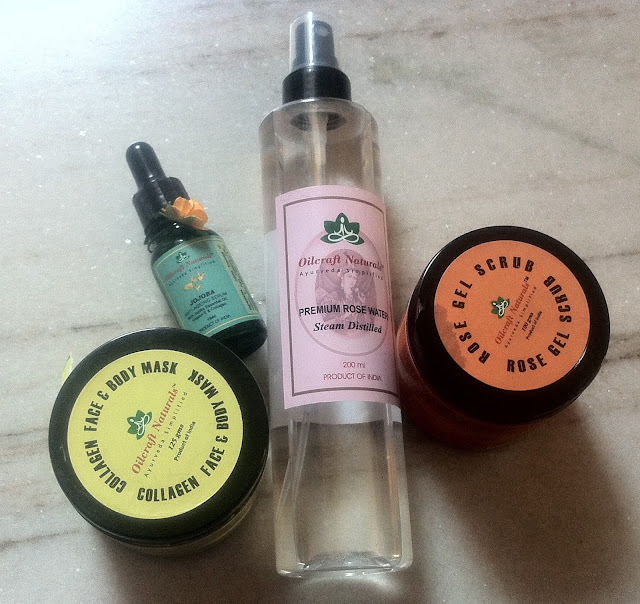 Till date, I have used their Vit E moisturiser, night cream, under eye gel, tea tree face wash and toner, gel scrub and protein shampoo and I’m extremely impressed by the quality, which can be matched to that of any high-end brand. 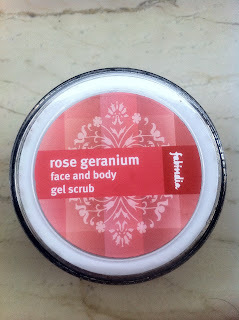 I picked up the Rose Geranium face and body gel scrub after hearing one of my friends rave about it. Since I have combination skin as well, decided to get one for myself. Helps balance both dry or oily skin by regulating sebum production. 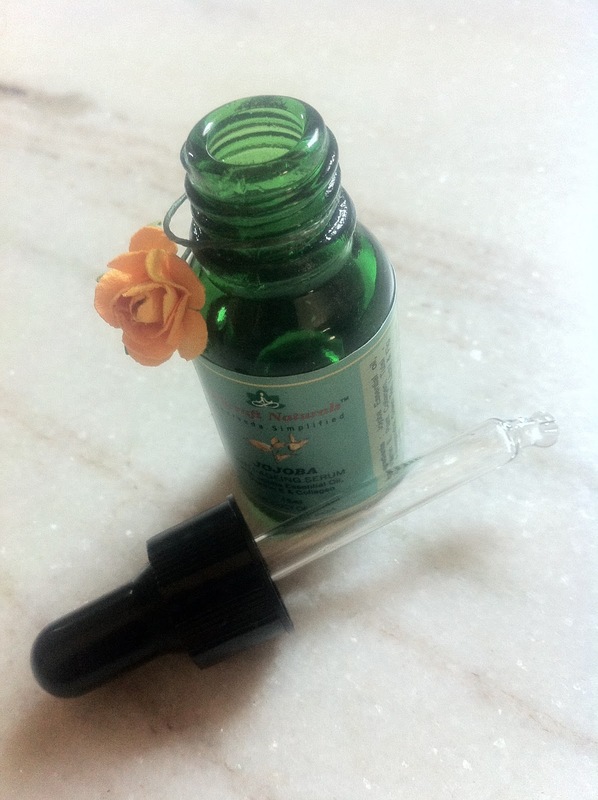 This is a wonderful oil for combination skin. It naturally cleanses and has antibacterial properties that aid in healing which can be of great benefit if you suffer from eczema or acne prone skin. Direction for use is the same as any gel scrub. You apply a scoop of the scrub to wet skin and gently massage on your face and body in circular motion, focusing on rough skin areas. The walnut granules are really mild and the gel has medium consistency – not too thick, not too runny. 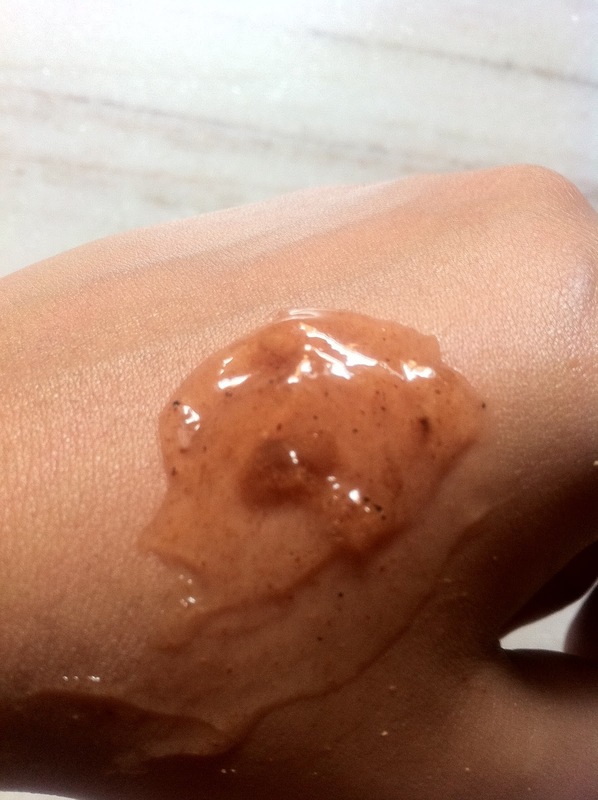 I love this scrub for four main reasons – the luxurious rose fragrance, the fact that it does not dry out my skin, for my squeaky clean fresh soft face after using this and that there were no breakouts. I have normal to combination skin so this scrub works very well for me but if you have really dry skin, do check out the tester first. What I didn’t love was the fact that it did not remove blackheads. Had expected some results there. 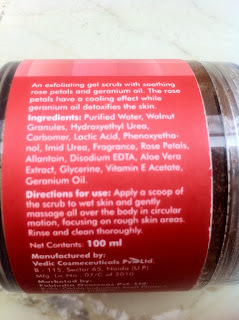 I also think its too mild to be used as a body scrub. For the face, it’s just perfect to be even used everyday! The Rose Geranium Face and Body Gel scrub is priced at Rs 225 for 100 ml and is available at all Fabindia stores and online as well. 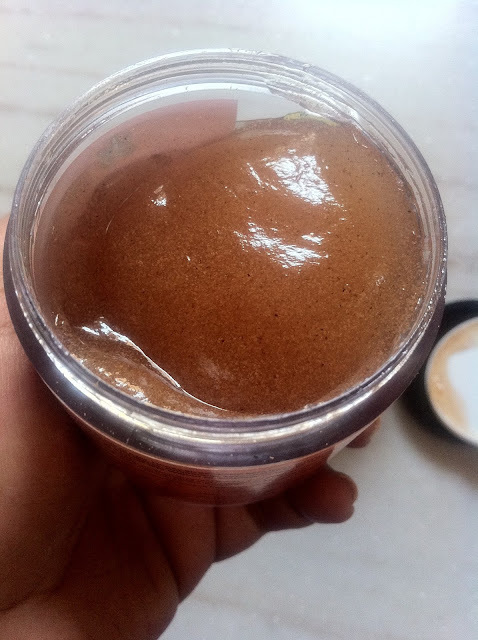 Have you tried any of these gel scrubs from Fabindia?